I gotta admit, This has been a real challenge. Not only squeezing this project out of a small piece of wood, but coming up with something to build to begin with. Just when I was about to throw in the towel on this one, the idea came to me over a couple of beers. So here it is. 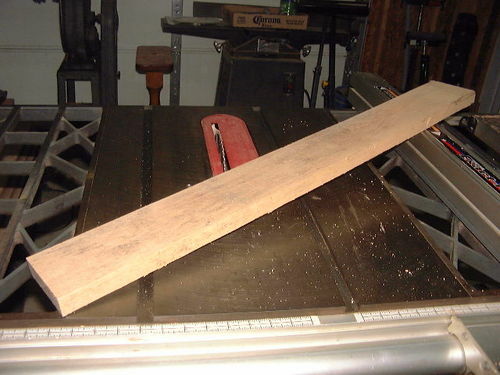 1×4x36 rough cut oak, 144 cubic inches of pure awsome….. The sides were resawed to a half inch while the inserts and bottom was finished to one quarter. Corner splines of eastern cedar and walnut were added as an added touch. The carrier was wiped down with a coat of BLO…. And the Miller looks ready to go. Nice abs, err I mean six pack!!! I like the first two pictures, but…..
There’s something off, not quite right, MISSING in the last three pictures!!! Randy, I had to shoot several test pictures while you were running the streets of R.I…..
woodbutcher, There’s only six that’s on record…..
Nice. And it’s always helpful to have a challenge to make you come up with something that you may not have thought to make in the first place. So what exactly was the challenge? I saw some other items with the same tag… I assume it was make something out of one board. But what were the parameters? Looks like you know how to win a woodworking’s vote. Nice idea, nice project. Nice idea, looks great. May have to make one for our evenings of r/r around the campfire. Can I place an order for several more of these????? Beers, that is, I can make the carriers, though not as well!!! eddie, They are cold, straight from the shop fridge…..
Randy, come on down. We’ll start an assembly line. You can hand me a beer and I can drink it…..
That is awesome! I love the photos showing how you can now safely set an entire 6-pack on the cast iron table. Maybe you could offer an optional rare-earth magnet embedded in the side for holding an opener.